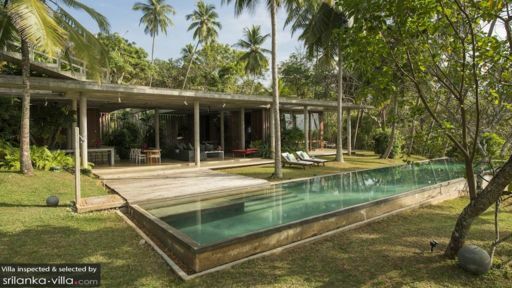 A modern home built with sustainable and eco-friendly Sri Lankan resources, Walatta House is a beachside villa in Tangalle with three bedroom suites, open plan living and dining areas, and infinity swimming pools, and expansive gardens. 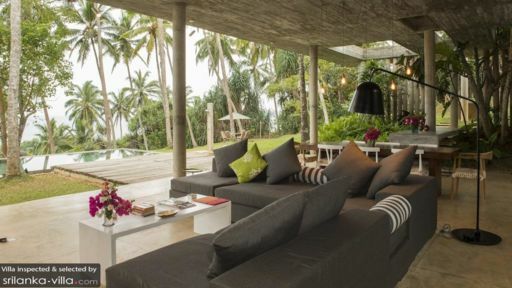 This concrete structure with polished exposed walls, sleek furniture, glass walls in bedrooms, and modern amenities, is one of a kind and stands distinct from all other beach villas in Sri Lanka. Gardens are lush with plants and numerous palm trees and you can spend hours walking around exploring the grounds. The beauty of this villa comes through in its ability to blend the outdoors with indoor living so you can make the best of both worlds. To the rear of the property, for a more private and exclusive stay, are the three luxurious bedrooms at Walatta House. The first bedroom is the master bedroom which leads to the swimming pool via glass doors that also serve as windows to an excellent view. The room is air-conditioned and is furnished with a king-sized bed. The other two air-conditioned bedrooms are located one after the other behind the master bedroom furnished with a queen-sized bed and single beds. The bedrooms feature a more contemporary design with minimal décor, exposed brick walls, lush green views, and dim lighting for a romantic setting. Each bedroom has an en-suite with outdoor showers and other amenities. Set on acres of land, Walatta House features a stunning 15-metre infinity swimming pool that sits facing endless patches of green gardens. A wooden deck connects the living room to the pool and just beside you will find sun loungers where you can relax, apply some sunscreen, and indulge in a nap. The gardens are flourishing with seasoned palm trees that form a thicket providing shade and a cooler ambiance. The infinity pool is the ideal spot from where you can enjoy hearty views of the Indian Ocean that dazzles under the tropical sun. The gardens are equipped with alfresco dining so you can take your breakfast against a formidable backdrop. With sustainable living at its helm, Walatta House has utilised locally-sourced, natural materials to build the property and you can see that with its concrete walls, wooden ceiling, and plants well inside the living area. The open sided living room is definitely the most ideal spot for relaxation as you can enjoy the view while at the same time lounging about on the comfortable sofas and chairs. Blooming flowers serve as the décor in the living room which leads to another cove-like room with L-shaped seating and a work desk. The dining area is part of this same space with an eight-seater dining table in the corner against delicious plants and trees for a luscious, verdant setting. A stone breakfast bar with high stools stands facing the ocean view as well for a quick bite or drinks. The huge land that surrounds the villa will keep you busy for hours upon discovery. The kitchen resides behind the breakfast bar with ample amenities and built with a similar rustic, stone design. Everything you could ever ask for is available at Walatta House with the friendly staff there to answer all your questions and ensure the villa remains clean throughout your stay. For laundry, massages, cars etc. you can ask the staff to make bookings as these come at an additional cost. A personal chef can be appointed upon request to help prepare daily meals. Staying at Walatta House is a spectacular chance to rid yourself of any and all worries where all you need to think about is walking alongside an almost private beach right at your doorstep, experience the sun-kissed skies unlike any you’ve seen before, and getting started on championing that tropical lifestyle. Tangalle is close to popular places like Mirissa and Weligama where you can enjoy surfing, whale and dolphin watching and even visit the turtle hatcheries. Walatta House exceeded all expectations.The house was in a superb position,set in a lovely garden which was only minutes away from a perfect beach.We had been worried about swimming in the sea having read that many beaches are not safe but that was not the case at Walatta's beach.Fantastic snorkelling.The pool was also great for swimming,kept in perfect condition by the attentive Suranja. The house was extremely comfortable,fresh flowers in the rooms,crisp white linen.Perfect. Madura was not only a wonderful cook but also efficient and helpful when helping plan our trips.Sorting transport and even organising a packed breakfast when we left at 4.30 for a whale watching trip.The food really was sensational with Madura keen to teach myself and our 4 children how to recreate a few of his amazing dishes. It really was the perfect holiday,Madura and his team were so kind and friendly-huge thanks to them all. Villa was absolutely fabulous. Stunning location and views, really comfortable lounging areas and bedrooms, and of course the highlight was the wonderful service and food from Madhura and team. Make sure you try the lobster! Thanks to all for a very memorable holiday. Amazing architecture, beautiful pool, incredible food. Thank you so much to Madura, Suranga and team for a great end to our Sri Lanka holiday. The house is absolutely lovely. Well kept and ideal for a few couples or small family. A short walk down the grounds leads you to a beach. Small but not crowded. Most of the time we were the only people at the beach. The chef will cook all your meals for you and you pay for the ingredients. The two young men working with the chef will spoil you rotten, from bringing you tea to lighting candles in the evenings to setting the table with a different napkin folding every evening! Tuk tuk driver also has a 7 seater vehicle that you can book. If you want to book any excursions, e.g. whale watching, fishing etc, ask the driver. He has some good contacts. Wally the dog is amazing. I am petrified of dogs and always avoid them, but Wally was so tame that I actually ended up patting her many times. Children will love Wally. Overall a very enjoyable and relaxing stay. An amazing 6 days in Walatta House that we didn't want to leave! Alwis is a fantastic chef and I would not bother eating out anywhere else as the meals we had out of the villa were substandard in comparison to his cooking. Suranga and the house boys are very respectful of our request for privacy while using the pool and the house was spotless and cleaned really well. My only criticism is that there must be signage put on the main road as it is very hard to find the house the first time you go there. Amazing location with a short walk through the property to reach the beach. However, beware that this beach is not suitable for swimming due to high undertow and rips. Lovely for walks on the beach and please take Wally (house dog) as she loves a good run along the beach and playing with the ball. Wish that we could have stayed longer and we definitely want to come back again soon. Highly recommend this for all others. We stayed at Walatta House for 2 weeks just before Christmas 2014. Our family group was made up of all ages and everyone loved the place. My husband and I, our 3 children aged 8, 4 and 1, 1 set of grandparents, and a 25 year old niece were all superbly looked after by the ever helpful Suranga and staff. The food Alwis cooked was just delicious (why eat elsewhere?) Jack's office arranged for a lovely lady called Kusum to come and help look after the baby (I thoroughly recommend her for anyone who wants help with their children) her English is excellent, she arrived punctually with a smile every day and looked after the baby better than I can. When our middle son fell ill Kusum whisked us off to the local hospital and helped us to see the right doctor and generally made life much easier. Pirantha - the most amazing Ayurvedic masseur came to us EVERY day - he is fabulous - you must have a treatment - it's very ayuvedic no thrills but you can feel yourself healing over the days. Now the house - it's beautiful it has been built with style and panache and has the exact right balance between eco and luxury. We loved the frogs and birds in the pool, the stunning butterflies, the enormous water monitors, the unceasing crowd of emerald beetles in the evenings. The planting is beautiful you really feel as if you are in a tropical jungle. Anyhows enough - it is wonderful here we cannot rate it more highly. Haven't even mentioned beautiful beach, rock pools, whale watching etc etc but no need to. We'd go back in a flash. The best thing about Walatta House is the location with a gate leading directly onto one a sequence of beaches which come more protected from the prevailing waves as you head West. The house itself is no overlooked at all, and being raised from the beach, is very private. The amenities are very new, and apart from a couple of temperature control issues with the guest fridge, the facilities and decor are superb, while the private pool is the kind one dreams of when booking an exotic holiday. The Manager / Chef, Alwis, cooks delightful meals and will accompany you shopping if requested. The food shopping is not as cheap as guests might expect, but the excelllent quality of Alwis' food is a lot better value than paying for similar in a commercial restaurant. There are trips that can be taken using Walatta House as a base such as the Whale Watching in Mirissa, but such is the loaction and accommodation it is perhaps more worthwhile taking advantage of Walatta House rather than having an active touring programme. One point of note for families. The rooms are not connected and therefore younger children might feel uncomfortable not having access through a internal hallway to their parents room, access bieng external. That said, at no time during our stay was there anything other than a serendipitous feel to Walatta House, but parents may wish to view the floor plan to assess suitablility for children <10 years old. This is the most incredibly stylish but laid back house, in the most amazing position above a beautiful empty beach. 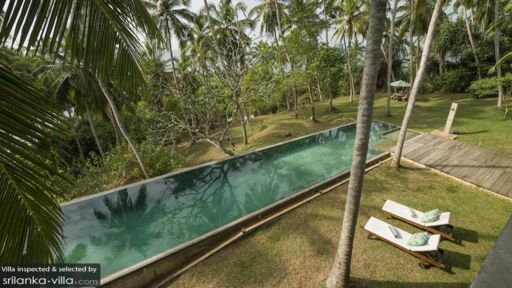 The house sits in the middle of a beautiful plot of land so is incredibly private, while being pretty close to everything you need in Tangalle. Architecturally, it is superb, the perfect mix of modernism and ethnicity.....without the compromise on luxury that this style can often suffer from. The staff where invisible but ever present, food delicious and so varied, endless pancakes for my children and perfect local curries containing so many dishes we did not know where the begin. Talk about a getaway. Work stress was quickly forgotten in this rustic yet luxurious villa. It was like survivor, with benefits. Diving into the pool or taking walks on the beach whenever we felt like it, in between excellent meals cooked by the staff. The breeze was amazing and while some of my friends enjoyed sleeping with just the natural wind, I was grateful for the air-conditioner in the bedroom (creature of habit). Getting a chance to take the sea plane was an added bonus as well as the lovely gem shop down the road!